A little peace of mind goes a long way. Sure, I let my kid play with a wide array of gadgets. And that’s the way it should be. I find that the more he plays and values the gadgets the less likely he is to destroy them. However, when he was younger that was not so much the case. He dunked a cell phone of mine in water — twice — and spilled an entire glass of water on my netbook. Now, there’s no such thing as 100% foolproof when it comes to your gadgets and potential destruction. But there are some things you can do to help prevent the worst-case scenario. For instance, there are DryDocs. The first year my husband took his beloved iPod to the beach, he put it in a Ziploc bag and trailed the earbuds out of it, lest some sand get into the gentle inner workings. It’s a good idea, but not exactly environmentally friendly; those little baggies only last so long. But the makers of DryDocs saw the cleverness in easy hacks such as these. 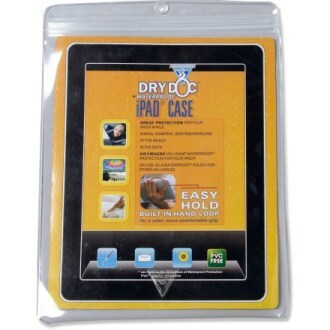 With a thick, non-BPA plastic (which is puncture and slash-proof) they created a durable little case meant for any manner of gadget. The best part? You can still use it when it’s in the bag. The plastic doesn’t hinder general use — not even talking (though if you’re an artist composing on the iPhone, it might get a little tricky). Not to mention it’s wonderfully inexpensive, in most cases under $10. That’s not a high price for peace of mind! You can find DryDocs at REI. A fantastic stocking stuffer or last-minute present!